I used my Lumix LX7 for my earlier post of photos at the Amherst Railway Society’s BIG Railroad Hobby Show (held last weekend at the Big E fairgrounds in West Springfield, Massachusetts). Ah, my old Lumix. Yes indeed. But, I was also carrying a FujiFilm X-T1 digital camera fitted with a ‘fast’ (wide aperture) 90mm lens. Using a 90mm lens at f2 allowed me to make telephoto views with very shallow depth of field. I think selective focus is a neat technique for capturing model railways. It’s a great tool for making portraits too. Below is a selection of views exposed at last weekend’s show made with my fast 90mm. 611 with Rainbow Consist plus a Bus at Amherst. That’s New England Central job 611. (A turn that runs from Brattleboro, Vermont to Palmer, Massachusetts). All I want to know is what Emily Dickenson might say about all this? Hmmm? PVTA bus crosses the old Central Vermont at Amherst, Massachusetts. Connecticut Southern 3771 leads NECR job 611 south at Amherst, Massachusetts on July 6, 2015. FujiFilm X-T1 photo. Leased CEFX 1016 on its way to Providence & Worcester. Tracking the Light posts original content on a daily basis! We had a late start, the weather was a bit iffy, and there wasn’t much running, but my father and I set out anyway to make a few railroad photos in the fall foliage. 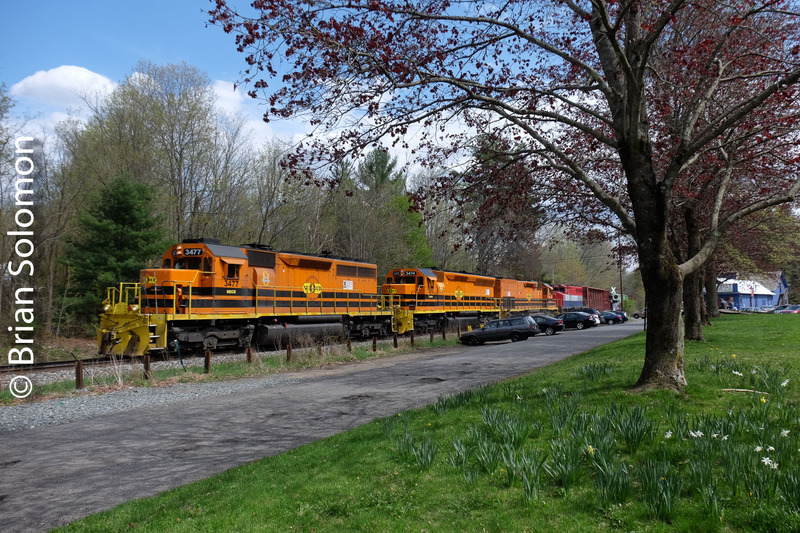 Since Amtrak’s Vermonter is in its final months of using the New England Central route between Palmer and East Northfield, Massachusetts, we made a point to intercept it in both directions. A New England Central local freight was working the interchange track in Palmer. Canon EOS7D with 200mm lens. For more than 19 years, New England Central’s blue and yellow GP38s have worked around Palmer. I wonder how much longer they will last? Lumix LX7 photo. Amtrak train 57, Saturday’s Vermonter works south of Amherst at milepost 82. A hiking trail runs parallel with the line at this location. New welded rail has been laid along the line. Canon EOS 7D with 200mm lens. A stop by Pan Am’s East Deerfield Yard found little moving except the hump engine. The old Boston & Maine line was pretty quiet. This is the view looking west from East Deerfield where I’ve made a great many photographs in the last 30 plus years. Canon EOS 7D with 200mm lens. A burst of sun at East Deerfield Yard. No less than four sets of road power were idling and the yard was full of cars, but not much was moving. Not everyday is busy in central Massachusetts, but I can always find photographs. Here’s just a few from our afternoon’s exploration. A spin over to Montague found a GATX slugset working the East Deerfield hump job. Canon EOS 7D with 200mm lens. I made this panned view of the GATX slug using my Lumix LX7. Millers Falls, Massachusetts, October 18, 2014. Amtrak train 54 the northward Saturday Vermonter crosses the Millers River at Millers Falls. Canon EOS 7D with 100 mm lens. Image adjusted for contrast and color balance.